For 2010, all models in the Ford Focus lineup come standard with remote keyless entry, power door locks, a driver's message center, and MyKey. Also standard on all models for 2010 is ABS and AdvanceTrac with electonic stability control (ESC). 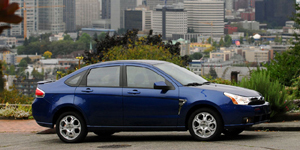 The 2010 Ford Focus Sedan is powered by a 2.0-liter Inline-4 with 140 hp. The 2010 Ford Focus Coupe is powered by a 2.0-liter Inline-4 with 143 hp. Find the used Ford Focus of your choice from a dealer in your area. Search our used car listings now.